With the reputation as the most expensive sports in the world, a multi-car Formula 1 team’s average annual budget is nearly $500 million dollars. Formula 1 has not only birthed multinational corporations and a viewing audience of over 500 million people, but its innovation and technological advances are permeating a plethora of industries such as cycling, healthcare, and big data. Formula 1 cars race at speeds over 185 mph and therefore requires the utmost safety features. A race car will have nearly 500 different sensors between the car and the driver in order to collect data to understand the condition of the car, the environment, and the driver. These sensors and data are being applied to healthcare in order to fight obesity, strokes, and arthritis, as well as creating products, such as high-performance bicycles, that have intelligence built into the materials. 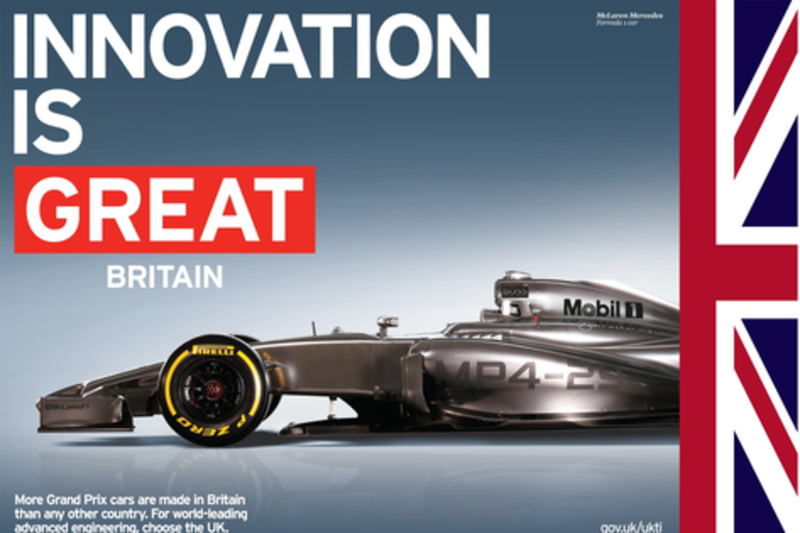 The innovation in “Motorsport Valley” is accelerating at Formula 1 speeds; don’t get left behind. Dan Rutstein is currently based in Los Angeles, California where he is the Regional Director of the West Coast for UK Trade & Investment (UKTI). UKTI is the specialist government organization that supports UK-based companies to trade internationally and assists overseas companies seeking to establish a presence, or expand in the UK. Prior to his current role at UKTI in the United States, Dan worked at the UK Embassy in Berlin as the Director General of UKTI in Germany, as well as the Department for Business, Innovation and Skills in the aerospace sector, and the Department for Transport. In a former life he was a journalist, but left his job covering sports in Bermuda for the opportunity to work in the public sector. Geoff McGrath trained as a mechanical engineer, initially working in aeronautical, civil, chemical, petroleum and mechanical engineering. Gaining experience, from conceptual engineering through to business development for start-up and blue-chip firms alike, he later switched focus to the world of telecoms, media and entertainment. In 2009, he became the managing director of McLaren Applied Technologies (MAT) and has brought more than 20 years’ experience to bear on the company’s innovative and dynamic approach to pursuing ground-breaking conceptual design, development and engineering. A is currently focused on developing and applying MAT’s specialist capabilities in the world of sports, health and well-being and strategic operations. Julian Jenkins is Vice President, Project Planning and Management, and leader of the Digital Platform Performance Unit at GSK. The digital PPU team are focused on harnessing digital technologies and platforms to transform the way clinical trials are conducted in Pharma R&D. He has a PhD from Nottingham University Medical School in the UK.